electromagnetic spectrum. Each region in the spectrum is referred to as a band. satellite often offers better (up to global) coverage. collect airborne data. Thus data are often only available for smaller geographic areas. When talking about spectral data, we talk from both, the electromagnetic spectrum and image bands. between 800 nanometers (nm) and 850 nm might be one band captured by an imaging spectrometer. The imaging spectrometer collects reflected light energy within a pixel area on the ground. amount of red, green and blue light for each pixel. band. Thus in a band spanning 800–850 nm, the center would be 825 nm. collect information within bands of uniform widths. a multi-band image individually using a grayscale color gradient. definition of terrain relief, mineral exploration, or study of composition of metals, for example. and using deep learning, to do its classification. Let’s do some examples of exploring multispectral images, using python and Jupyter Colaboratory. First start reading some tif files into colaboratory. serve to the learning machine of our classifier. What is the difference between SAP ERP and SAP ECC? Is ECC a component of SAP ERP application? SAP ERP 6.0 is a product offered by SAP which contains business solutions such as Finance, logistics, HR etc and industry solutions such as Oil and Gas, Insurance, Media, Utilities, Retail etc. These business solutions are enabled by several technical (software) components. A product is broken down (made modular) into software components because a component is designed for re-usability which means that one can use the same component to build a new product. This results in shorter lead times to deliver a new product. However, a software component alone may not be really a “standalone” software component. For example, in case of a car, piston of its engine by itself is of little use. But the engine made out of it is a major component of the car. Therefore, the components are grouped into a super component. This in SAP ERP world is SAP ECC. Much like the engine of a car, its components cannot be installed separately, you have to install all the sub-components in SAP ECC - the entire engine. Like a car’s engine consists of pistons, shaft, cylinders, SAP ECC (The engine) consists of several sub components such as Logistics and Accounting(SAP_APPL), Financials (SAP_FIN), Human Resources (SAP_HR) etc. and technical platform components (For example, gasoline car vs diesel car) Application server (SAP_BASIS) and Cross application components (SAP_ABA). Then you get industry specific solution components, names starting with IS-; extensions (Enhancements to standard functionality), component names starting with EA-, so on and so forth. You can explore these sub-components after having logged on to SAP by going to menu option system > status and clicking details button next to the ECC component. In the image above, you can see that the complete product SAP ERP 6.0 can be configured with several (super) software components but SAP ECC 6.0 is a mandatory one. This requires a minimum of SAP Netweaver 2004 to run. PyTorch is an open-source machine learning library for Python, based on Torch, used for applications such as natural language processing. It is primarily developed by Facebook's artificial-intelligence research group, and Uber's "Pyro" software for probabilistic programming is built on it. 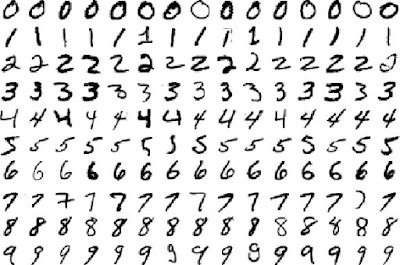 The MNIST dataset was constructed from two datasets of the US National Institute of Standards and Technology (NIST). The training set consists of handwritten digits from 250 different people, 50 percent high school students, and 50 percent employees from the Census Bureau. 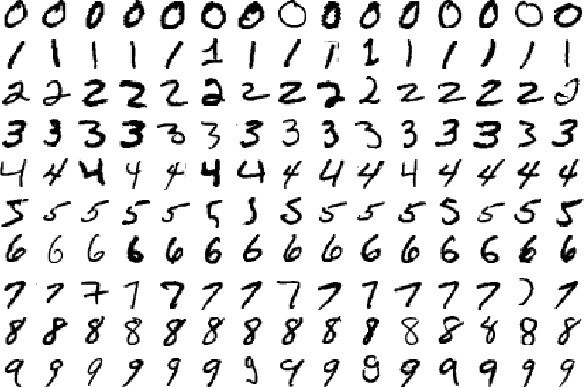 Note that the test set contains handwritten digits from different people following the same split. Look for development details on my GitHub. In March 1989, Tim laid out his vision for what would become the web in a document called “Information Management: A Proposal”. Believe it or not, Tim’s initial proposal was not immediately accepted. In fact, his boss at the time, Mike Sendall, noted the words “Vague but exciting” on the cover. The web was never an official CERN project, but Mike managed to give Tim time to work on it in September 1990. He began work using aNeXT computer, one of Steve Jobs’ early products. 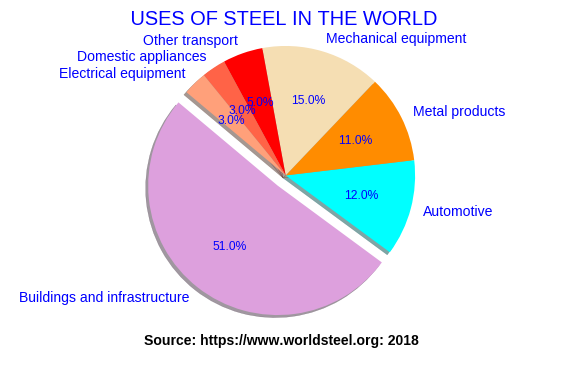 The objective of this work is to analyze the production of iron and steel using machine learning. 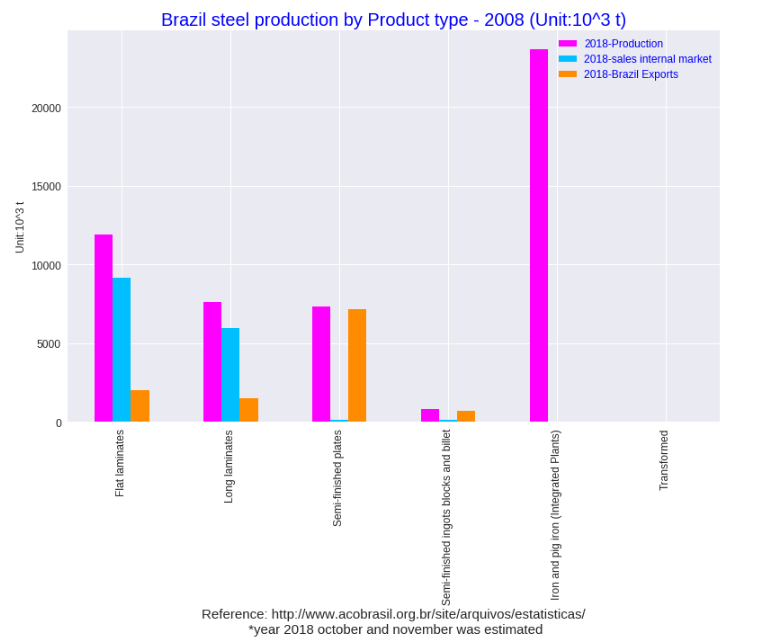 The data was obtained from web sites of the specialty and gives a greater emphasis to the production in South America and Brazil in particular. The information about year 2018, is real information from January to October 2018 and is projected to November and December 2018, because we are ending November 2018. 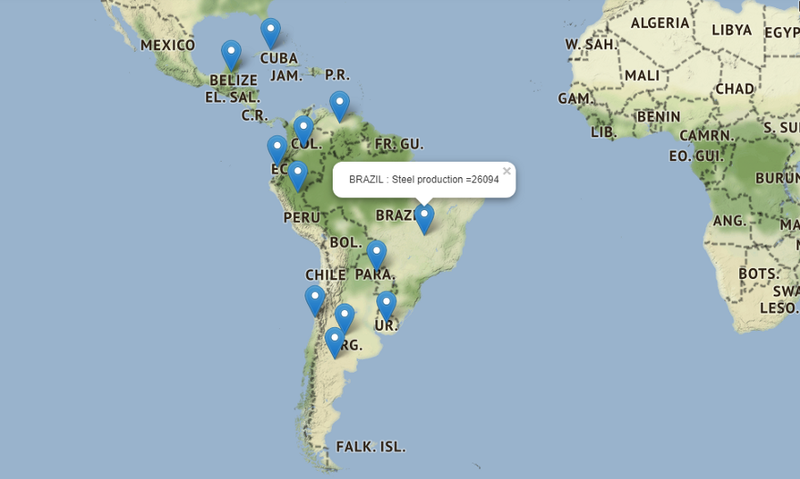 This work also trains the use of interactive maps of the folium package, to present the statistics. 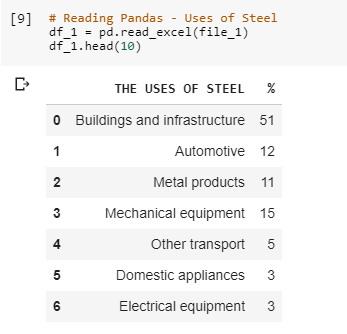 I used the Collaborative Jupyter Notebook, from Google, to made this work. Complete python work is in Github. 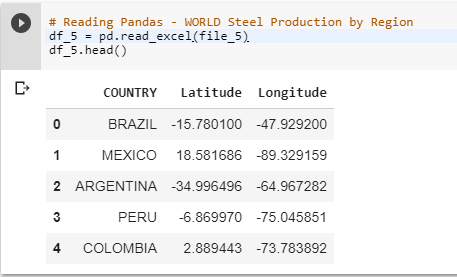 The data sources to create graphs are in Github (folder data) in excel format. Need install package xlrd to read excel files. 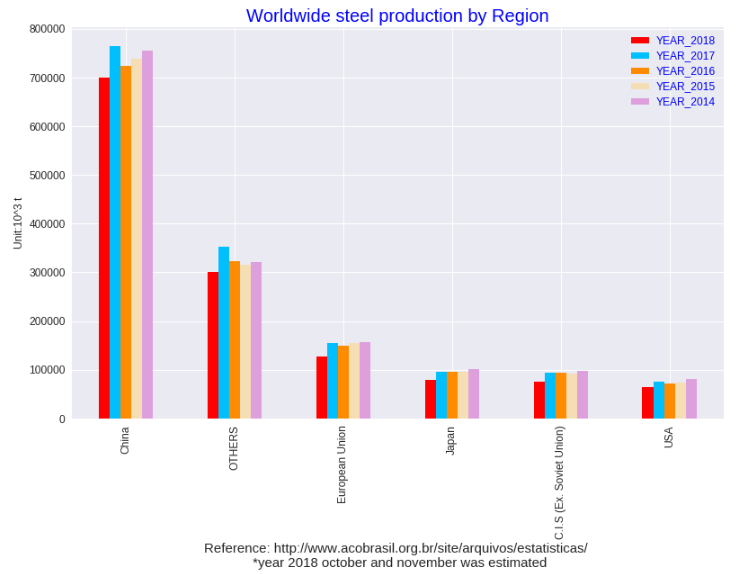 The graph shows a decline in iron and steel production in 2018 in all markets. 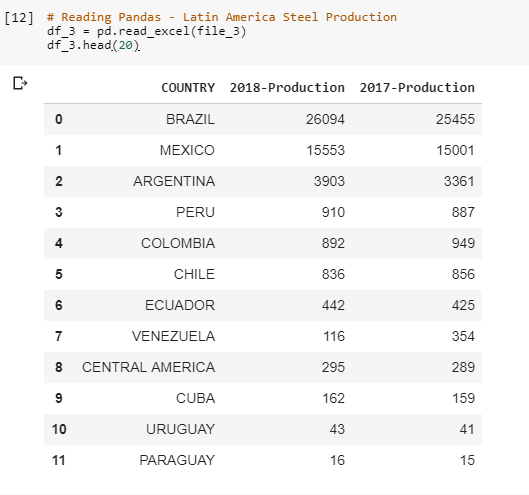 I create a new column in the dataframe to make the tootip that i want to present un the flag-mark. To print the stats in the map, I used the code bellow. 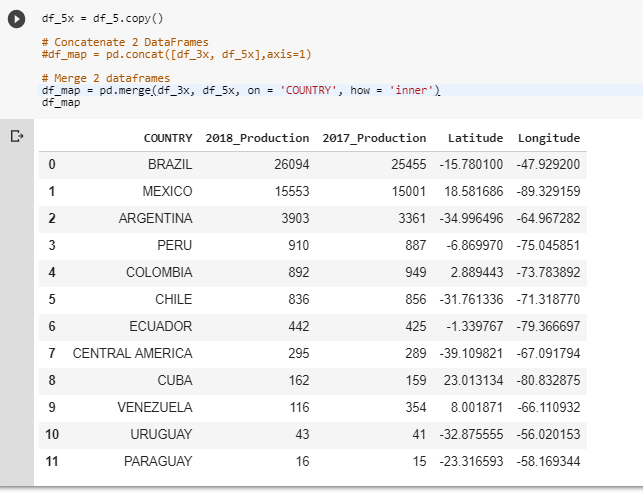 I used the dataframe to pass the coordinates to the map. The system creates a beautiful map. 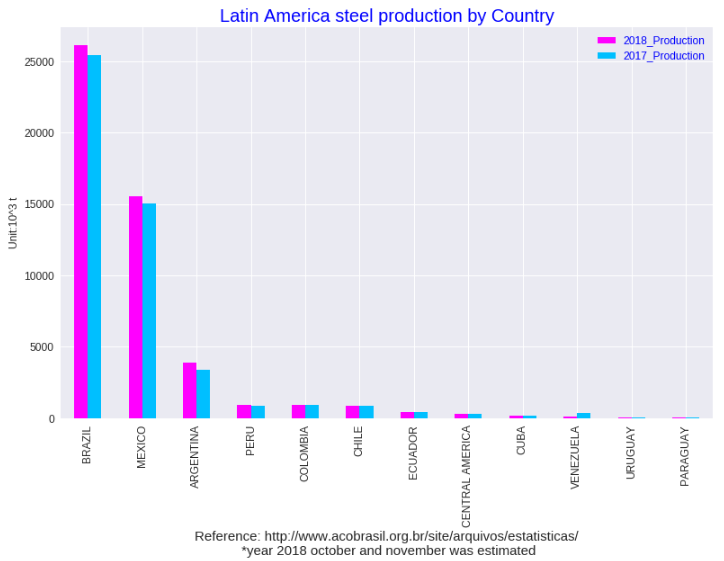 When we click in the mark-flag the system presents the name of the country and it’s steel production. Because i’m in Brazil, let’s go watch what’s up here. I have many informations by year, about production and sales. I make separate graphs to explore the information. 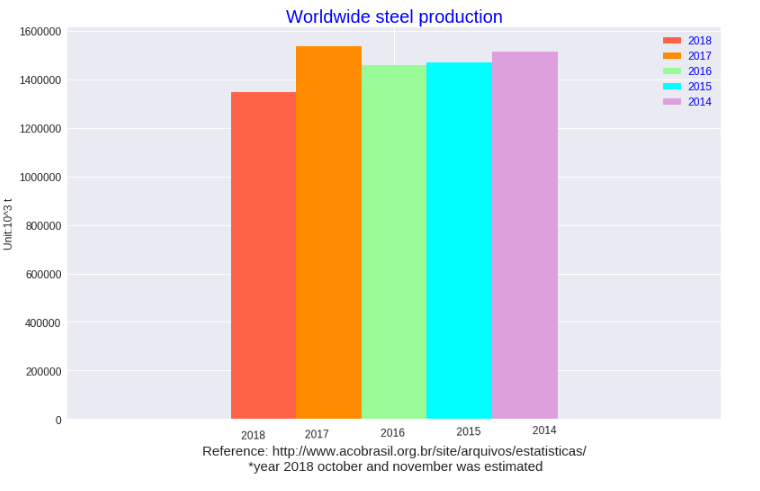 In this chart we see the same trend, that production in 2018 is lower than in 2017, in all types of steel products. 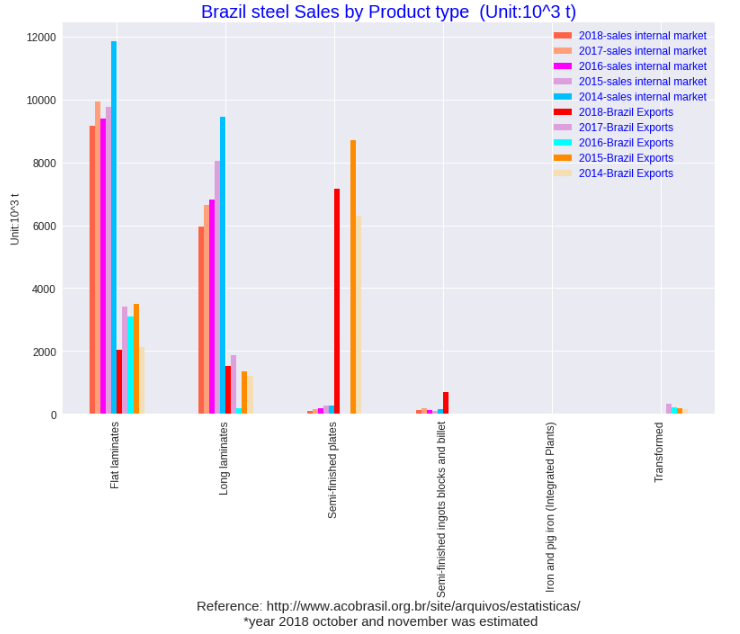 Sales in 2018 are lower than in 2017, both in the domestic market and in exports. 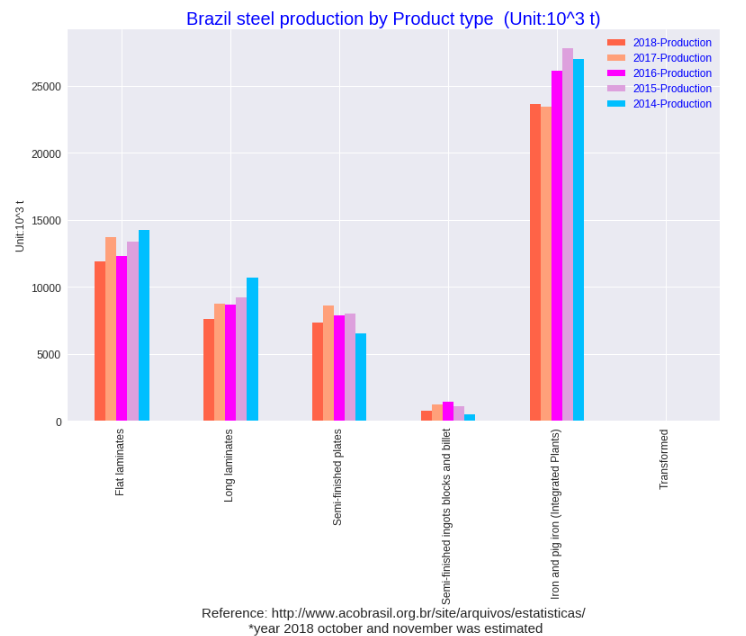 At the conclusion of this work, there is the knowledge about the steel and iron production market, the best knowledge in the Brazilian market. 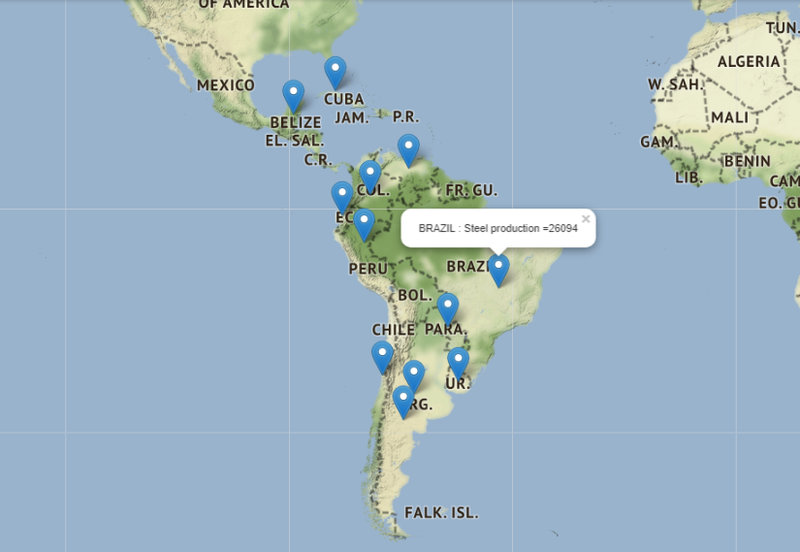 Printing on an interactive geographic map will be an excellent tool for presenting future work on websites.